Harry Potter World continues in Fantastic Beasts, but set way before Harry in 1920's New York. 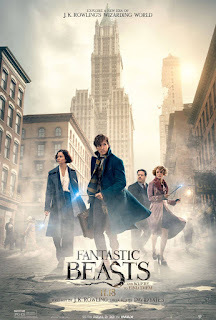 Newt is visiting America with a suitcase of beasts that he is trying to rescue from extinction as many wizards don't understand them, and of course some of them escape. The American wizards are set on keep the Nomaj (Muggles) and magic word separate, so having mystical creatures on the loose does not go down well. Meanwhile the New Salem group of anti-wizards are attacked which adds a good twist to the story. Who it attacking New York, is it Newts' beasts or something else more evil? The cast is great and gel together well. The story keeps moving if a little slow in places. The D-BOX actually snoozed quite a bit, but the 3D really popped. Literally popped right out the screen with a few of the tiny creatures coming right out into the cinema with a few shreaks from audience members as they hover in front of your eyes!